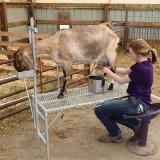 If you have dairy goats, you know that milking can sometimes be a challenge. So we’ve introduced a milking headpiece that fits neatly onto our trimming stand to securely hold nannies at a comfortable height. 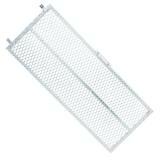 Built-in feeding tray holds enough feed to distract your animals during milking. Locking headpiece holds them in place—they can’t leave until the milking is complete. Headpiece adjusts to accommodate goats large and small (more so than other available headpieces). Lightweight design is easy to move from place to place throughout the barn. 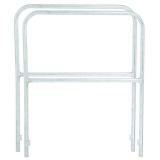 Securely holds goats at a comfortable height for milking (floor of stand is 22" above the ground). Comes with a convenient carry handle. 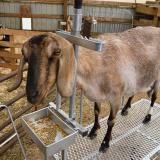 Easily convert the milking stand into a trimming stand by adding a trimming stand headpiece. 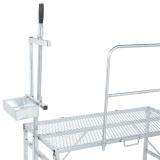 To securely hold animals at a comfortable height for milking (22" off the ground). 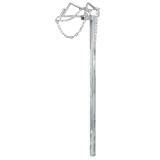 Headpiece adjusts to accommodate animals large and small heads (more so than other available headpieces). Built-in feeding tray holds enough feed to occupy nannies during milking. Lightweight design is easy to move throughout the barn. 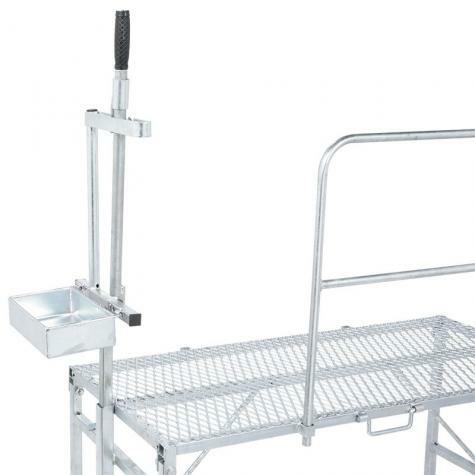 Folding carry handle on the stand and ramp prevents animals from getting their legs caught. Headpiece securing bolt (easy on the fingers). 1" x 1" square tube is 28" long (measured from the bottom of the head piece). 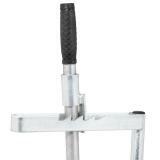 Thumbscrew enables users to adjust the front vertical bar up or down to fit most animals. The widest part is 7.5" and the narrowest is 2.5" with 5 adjusting positions on the top and 3 adjusting positions on the bottom. Tray is 10" x 6" x 2.5"
25" tall and 21-1/2" wide. I've been using 2 of these stands in my new little milk parlor for a couple weeks now. They're good solid stands, easy to set up, and look like they'll probably be around long after I'm gone. These are slightly taller than most other stands I looked at, which is a bonus for me as I'm tall and I raise Nigerians. I love that the head piece has enough adjustment that I can even put little 3 month olds on the stand. I would only change 2 small things: I don't like that the feed tray cannot be removed. It makes it impossible to dump out leftovers, or take it for a wash if one of the girls leaves it slimy. My solution to this was to use a cheap bread pan as an insert. It fits perfectly and makes for easy cleaning. The other thing is that there's no pin/strap/etc to hold the legs against the stand when you are carrying it folded. They just flop all over the place, either hanging up in door ways or banging into your shins, depending on which way you're holding it. I suppose I'll add a bungee cord or something to make moving them easier, but it would be much neater if the design allowed you to pin them in place. Works great for trimming hooves. Just the right height. Glad I got the side rails. They keep the other goats from jumping up while I trim. They want to see what the other guy is eating. Well constructed and easy to store when not in use. I could see taking this to shows for milking but I would have RN have a dolly to move it in and out. To heavy for me to carry long distances. Stand measures 20.5" bench width; Bench Length 48" (4'); 21.5" bench height and 104" (8' 66") Total Length with Ramp Attached. Stand and ramp appear to be well made, sturdy, welds look good and with the metal being galvanized/dipped, this should last us a lifetime for milking and caring for our Nigerian Dwarf goats. 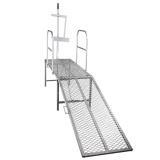 If you are buying this for smaller breeds, you will definitely need the ramp. Shipping was included in pricing and you cannot get around high shipping costs due to weight and size of item. 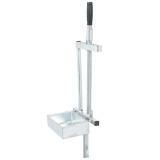 We had considered making a wood milking stand but thought it would be unsanitary and hard to sanitize - looked at a lot of milking stands on the market and chose this one for quality, ease to keep sanitized, virtually rust proof, and appeared to be well made - the cost was better than expected considering shipping charges/gasoline prices. I'd recommend this product to others.